This is going to be a fun event! I'm very excited to be invited to be a vendor at the new "From Our Hands ~ Creative" that Lori Corelis and Rebekah Smith are organizing! The show they put together in November, in the same venue, was a great success ~ we were shoppers there and loved it, along with so many others! These two gals know exactly what to do to bring together great craftsmen and savvy shoppers, so you know you're in for a treat! 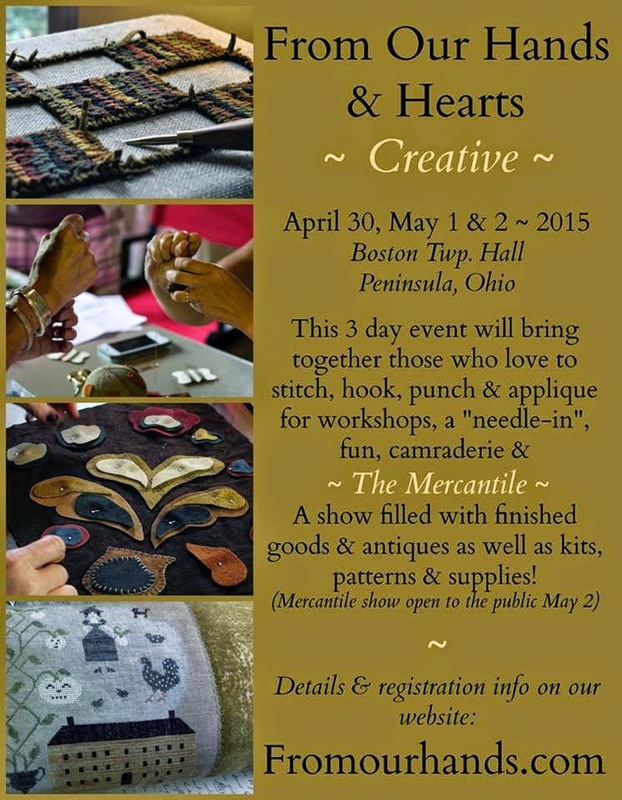 There will be a day of classes on April 30th, a 'needle-in' on May 1st along with a preview shopping evening, and on May 2, a show for the public!! Penninsula is a lovely little town, very picturesque so it makes a great destination get-away! I hope to see many of our friends and customers. I'll keep you posted on any news and check their website for an updated list of vendors! It's a snowy day here in Ohio ~ I spent most of it in the office getting things in order! Good day to be inside! I hope all of you are well and warm! Talk to you soon and thanks for stopping by! It's been sooo long since I posted so thought I would show you this little sheep pillow that I made for a friend. 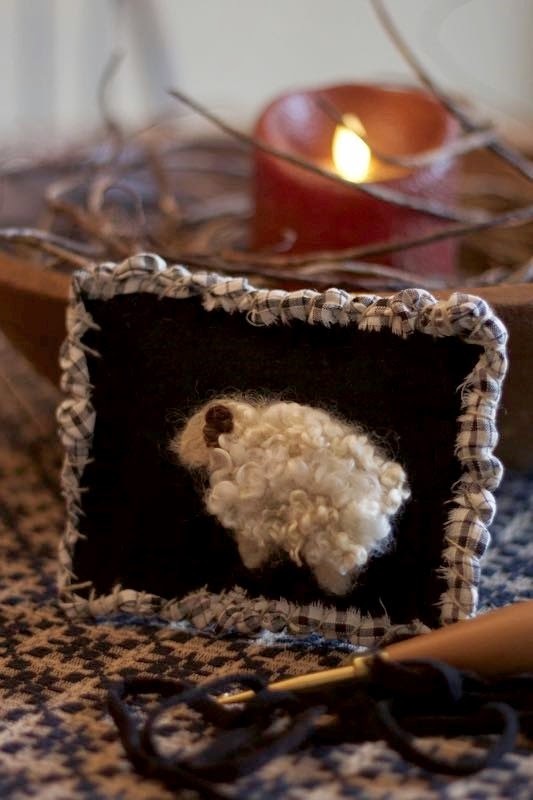 The sheep is needle felted with Wensleydale fleece that we brought back from England almost 9 years ago ~ I use it very sparingly but save it for special things. The stuffing is from my snippet bowls ~ little bits and piece of wools and thread give a little heft to your project moreso than fiberfill stuffing and it's recycling at it's best! The binding is vintage homespun (Sonny's aunt gave me a bag of scraps years ago that weRE left from his grandma's sewing projects) that I whipped onto the edges using linen threads that I keep when I'm cutting linen yardage! Waste not ~ want not!! That isn't exactly me in my everyday life ~ wish it was ~ but it works out great for handmade projects!! I hope you're all well and having a good winter! We have recovered from the Christmas craziness and I'm just wrapping up all my year end things for the business. Have my office all in good order for the first time in a long time! And we're getting ready to go to Florida ~ thanks to my wonderful Tad sitter for holding down the fort for me and taking such good care of him! Sonny will be working right up until the last minute to finish a couple of projects he's had all winter and I will, too! I'm getting in a quick beginners class on Sunday for some gals and drawing some patterns for another! I'll do better about staying in touch ~ I haven't even been a good blog reader over this last couple of months!! Thanks for stopping by ~ I really appreciate it!